Sign up to receive Father William's Searching Deeper writings by email. It began as a sharing of bread and wine among close friends at an ordinary dining table. Why was this meal so important? In this book, I describe the Holy Eucharist in a brief, non-academic, theological and historical context and then unfold some of the great riches of the spirituality of the Sacrament. 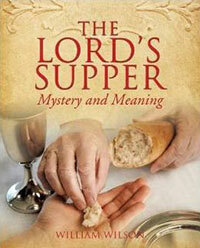 I hold this vision of the Lord's Supper dearly and I desire to share it with those who desire to receive it. "Father William's exposition of the Eucharist will bring light, depth and purpose seldom seen….Perhaps, more importantly, is his ability to enlighten our understanding of the mystery of the Eucharist so that our hearts and minds can grasp the spirituality of receiving the "Body and Blood" of Jesus Christ." © 2009 Spiritual Life Ministry Foundation, Inc. All Rights Reserved.